Unlike the original blog, I have delayed putting this page up until all material is posted. This permits reading the articles in first to last sequence, unlike the usual blog format which goes from the most recent backwards. Because there is so much material, I am going to break it down by year. 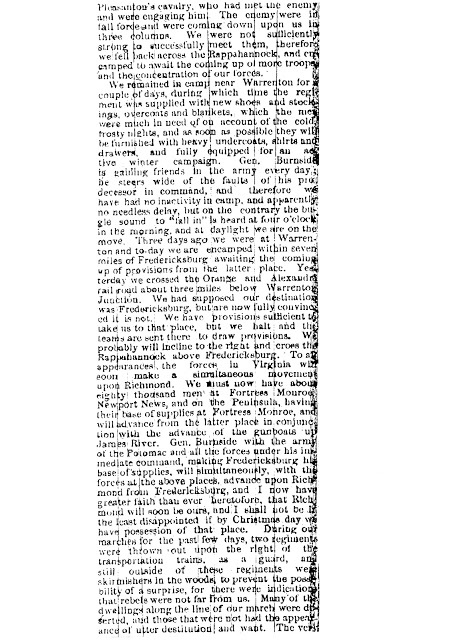 This page is about the war in 1862. Here's a bit of clarification of a few things in the following article. The heading is: From the Fifth Regiment with this subheading - In Camp Christmas Among the Soldiers - A Scouting Party - A Rencon-tre (sic). 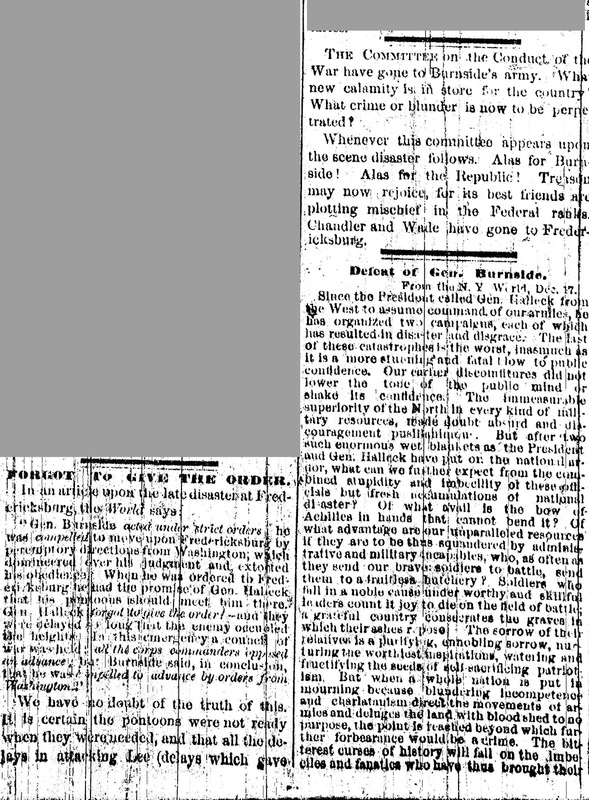 The date it was sent to the Free Press was January 2d, 1862, which shows the delay receiving and publishing it. Lois: Once again I feel apologetic about the quality of these microfilmed newspapers, but know I did what I could to clean up safely the articles using the accessory, Paint. It's admittedly crude. Some of the clarification of this article came from alternate filming by John Braden. In the meantime know that the Fifth Infantry articles will start to increase as they began to see more action. That alternate film cannot be cut apart, but it reveals these final two paragraphs (note also a different spelling of the lieutenant's name from the second article which follows this one). And now to come to a piece of news which will present the other side of camp life. Lieutenant Denison, Company I, of this regiment, while in charge of a few men who were ordered to accompany a body of cavalry on a scouting expedition towards Pohick Church, was fired upon by a body of rebels lying in ambush, and wounded, a rifle ball passing through his under jaw and out of his neck. The wound is a serious one, though not dangerous, and will probably compel the gallant Lieutenant to return home for a time to recruit his health. I am gratified to be able to say that throughout the affair he behaved with great credit to himself, evincing a quiet, determined courage, which with the bravest of men is commendable, and although our party was obliged to retire they did so in good order, without losing a man, while two newly made graves showed the next day that our firing had done some execution. Such little encounters as those which occur now and then, serve to keep up a healthy excitement which cannot fail to be productive of good to the cause whenever the hour arrive for us to enter a general action. It is understood that there are some officers to be sent home on recruiting service, as our regiment needs a few men. Are there any laggards behind? If so, let them leave the everyday life they are leading and come forward. Now is the time to join their brothers in arms. Will they remain at home in the hour of their country's peril and at the moment when the army is about to march on to victory? Let those remaining behind enroll themselves at once that they may in after years be enabled to say: "And I too was there." I am grateful to fellow researcher on the Fighting Fifth, John Braden, for his generous sharing of additional material that adds to a view of this same period. 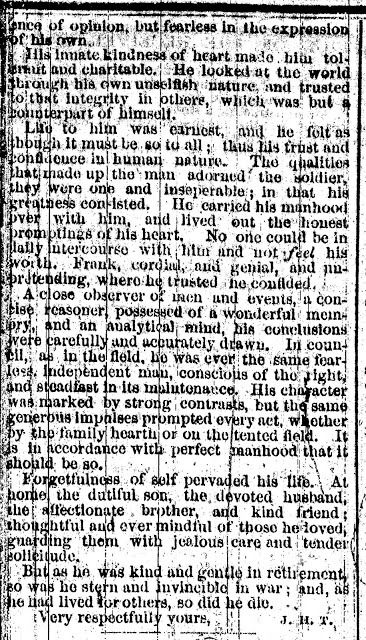 It comes from an unknown newspaper, found in a scrapbook put together by Ada Worden starting in 1861. 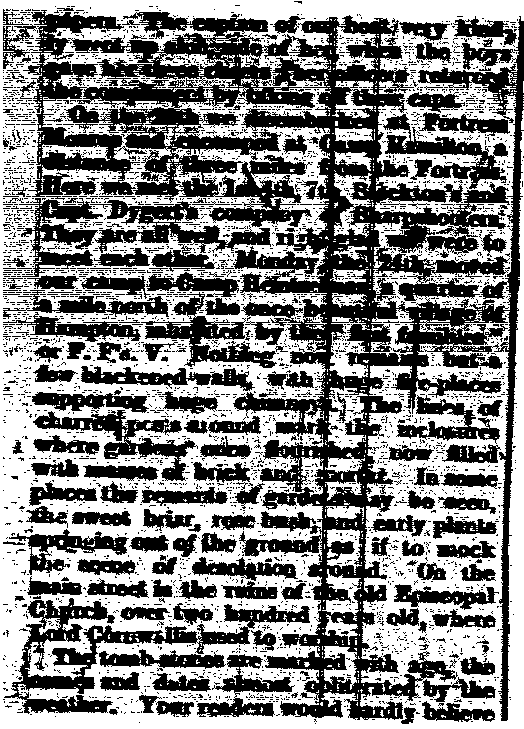 Not only is the newspaper unknown, but the first page also is no longer in the scrapbook and, just as with the illegible parts of the Free Press, not everything can be seen. In some cases Ms. Worden wrote what was illegible even at the time of obtaining the newspaper. 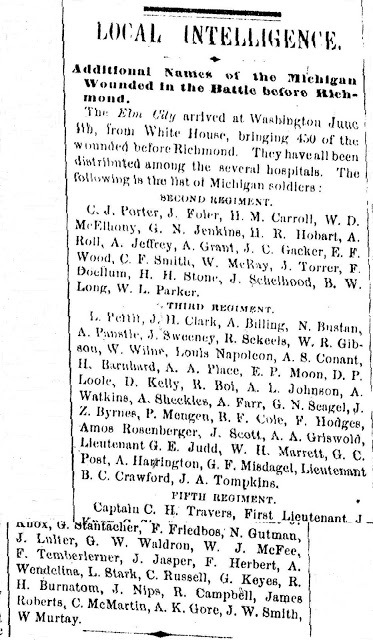 Even with those important omissions it is worth adding to the information given in the Detroit Free Press article as a useful supplement, even clarifying the name of Lieutenant Dennison, who was shot. The article's author, S.B. Curtis, I had hoped to turn up in future research so I could update this date. This additional item was located by John Braden. Thank you, John, for this and other unusual items you have shared. His library used a different publishing time from the newspapers microfilmed at the Library of Michigan. 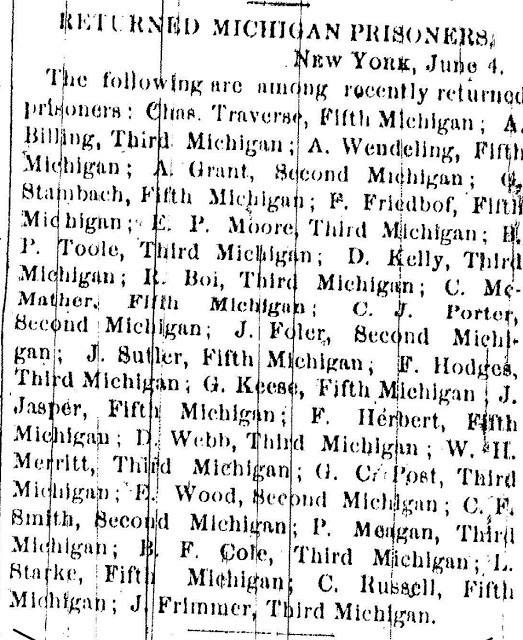 Similarly the indexing by Helen H. Ellis in her book, Michigan in the Civil War: A Guide to Material in Detroit Newspapers is an excellent resource to the newspapers in the Burton Historical Collection at the Detroit Public Library, but the publishing time difference sometimes produced no article at the Library of Michigan. Still if it's about the Fighting Fifth, this is the place for it. It's with great pleasure that I welcome additional material sent to me by fellow Fighting Fifth Infantry researcher, John Braden. He has sent me a few newspaper articles from this area, but some beyond the Detroit newspapers. Additionally his transcriptions sometimes clarify microfilms. These additions are worth looking back over this month's posting so far. The story below continues, but to read it you must go back to the next column for the conclusion written by Ennius. 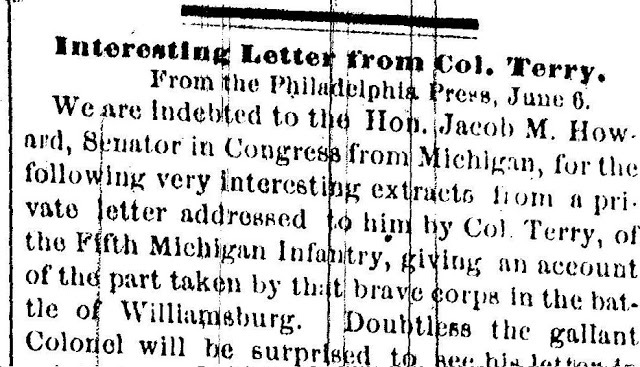 Fellow researcher into the Fighting Fifth, John Braden, turned up this unusual resource -- the Livingston County Republican from Brighton! How great it is to have such help. Thanks to John Braden the parts of this article that were faint appear better. . . the joys of his using a different copy! It was worth doing an update over the initial post. The curse of microfilm is that you're at the mercy of the original and the film. Some of this is "blobby", including information on Captain LaFavour. I usually "clean up" the edges, but this first column shows how the filming cut off part of the article. 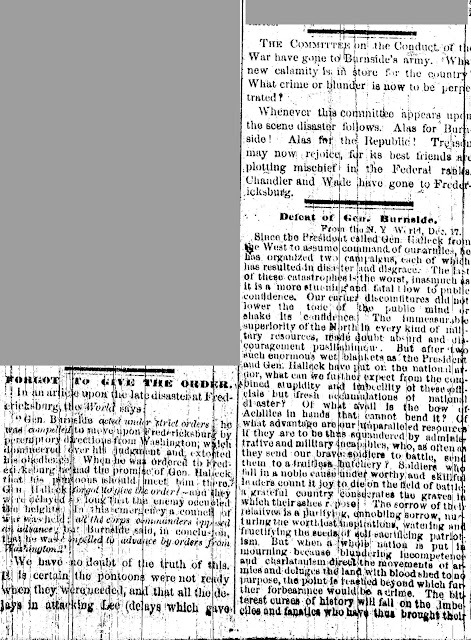 Thanks to a transcript from John Braden, a May 14, 1862 Detroit Free Press article may answer some of the questions this article raises, but does not go into the detail of this article. (Please note, this article is from the Detroit Daily Tribune.) His transcription follows this article and my own comments I called "Apologies, Excuses, and Trying to Do Better." As was pointed out to me, this site about Michigan's Civil War "Fighting" Fifth Infantry is truly a "labor of love." There's no promise many people will discover it. The material I worked with often is in less than legible condition and my tools to improve it are limited. My apology for that. Added to that, this site is in addition to my other work as a storyteller, so like any "day job" it sometimes must wait for time to do justice to posting here. Again I apologize for that. Then there are the myriad of personal things behind the scene, be they technological like a change of computers or ... well, personal things. My apologies for posts throughout the month of May. Something I accidentally overlooked was material sent to me by Michigan re-enactor and fellow researcher of the Fifth Michigan Infantry, John Braden. John did all of us a great service by sharing some of his research with me back in January. Unfortunately because the material is scattered over a variety of times and sometimes beyond the Detroit area newspapers, I have overlooked the dates when the material occurred. That is inexcusable and I took steps to interfile it with my research so that didn't continue to happen. My apologies to anyone following this site, but especially to John Braden. As said in the title to this post, I dedicate myself here to "Trying to Do Better." My next step was to go back and add a label of "John Braden" for those January 14 posts and then use it on anything he sent that I didn't located on my own. John, you haven't requested any of this, but it definitely is deserved. Thank you for your generosity. Additionally, John did a transcription of some Detroit Free Press articles that are most helpful. In the first instance he had an article from May 14 that may clarify the "blobs" on the May 14 Tribune article. John, you pointed out the differences sometimes between the D.F.P. a.m and p.m. editions and how some libraries offer one, while other libraries have the other. I've no idea how you managed to get a better source, we really must get together some time! As you yourself told me, when it comes to software "you can't do much about black spots." This transcription is courtesy of John Braden's research. Thank you so much, John! You may also note yet another spelling for Captain LaFavour/Lefevre/LeFavour. Unfortunately this is common in historic and genealogical research. Capt. E.T. 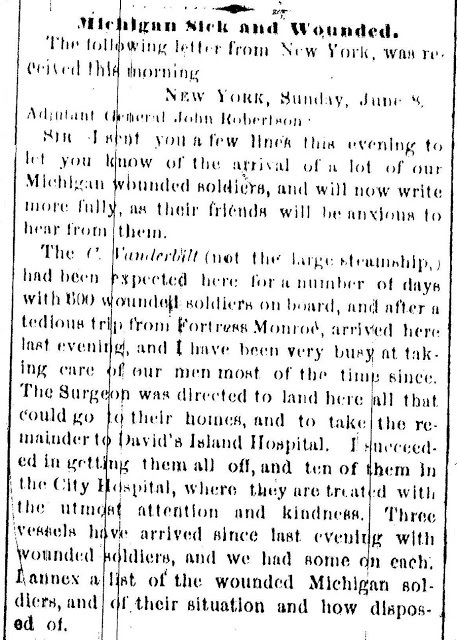 Sherlock arrive in town Tuesday morning direct from Williamsburg, in which battle he was wounded by a shot passing through the arm, just above the elbow. The Fifth was in the thickest of the battle, and fought like heroes. Company A was deployed as skirmishers on the right, and advanced against the enemy through mud and water waist deep. Its loss was probably more severe than that of any other company. Every man in the regiment came up to the work without flinching, and went into the fight with a spirit that needed no incitement on the part of the officers. Charging on the enemy they drove them from from their strongholds, and, in spite of their desperate efforts to retake them, held possession of them. 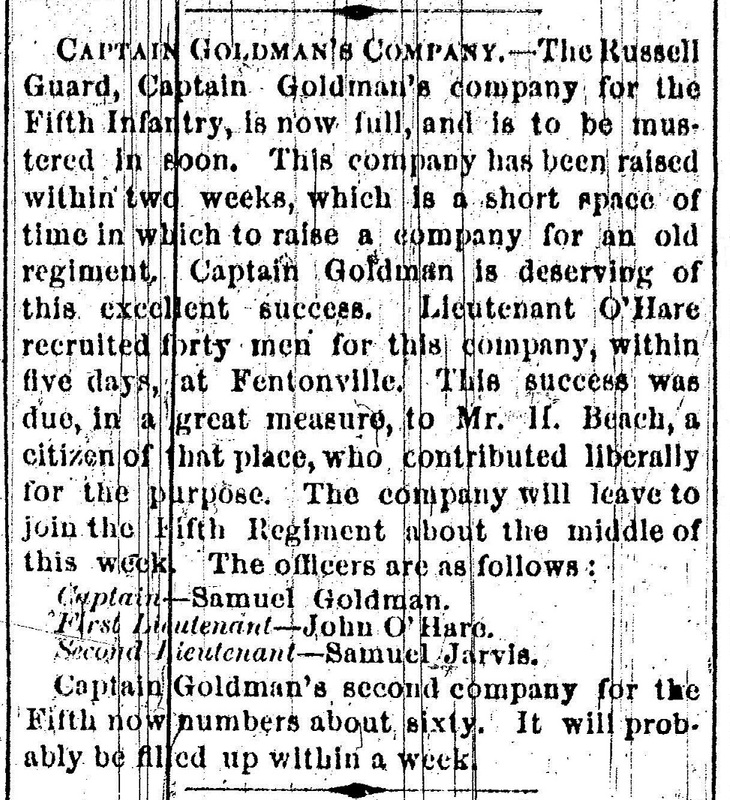 The gallantry exhibited by the Fifth, when the official reports of the battle of Williamsburg shall have been sent in, will receive that praise which the New York correspondents, in their excessive anxiety to get up a glowing account of “our own New York,” have failed to give it. Colonel Terry was wounded slightly by a ball, which, striking his stirrup glanced and inflicted a wound in his foot. The wound was dressed, and the Colonel was again in his saddle in less than half an hour, gallantly leading on his men to the fight. Lieutenant Colonel Beach was shot though the thigh, the ball passing through the flesh without shattering the bone. 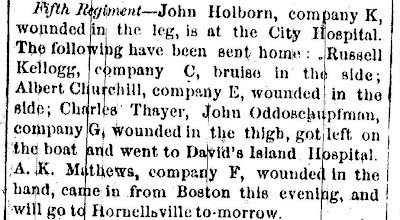 Every one will be delighted to learn that the brave Colonel is now at Baltimore, in a private family, where he is receiving every attention, and that, under the care of a skillful surgeon, he will not lose his limb, as was at first reported. Captain LeFavour and Lieutenant Tillotson were also wounded. All the wounded were at once sent back by Dr. Gunn to Fortress Monroe, from whence all who were able to be sent were conveyed to Baltimore. Most of the officers are now there, many of them in private families. As soon as able to bear the fatigue of railroad traveling, they will at once come home to remain until fully recovered. The regiment is very much shattered by the sharp contest in which they were engaged, and, although it has gone on with the army, it is doubtful if for a time, at least, it will be able to take an advanced position as before. The many friends of Captain Sherlock will be glad to learn that his wound, although debarring him for the present from performing active duty, is not likely to prove a serious one. The Captain thinks it possible for him to take to the field again in a few weeks, and announces his intention to place himself again at the head of his brave company at the earliest possible moment. Yet another transcription from John Braden! 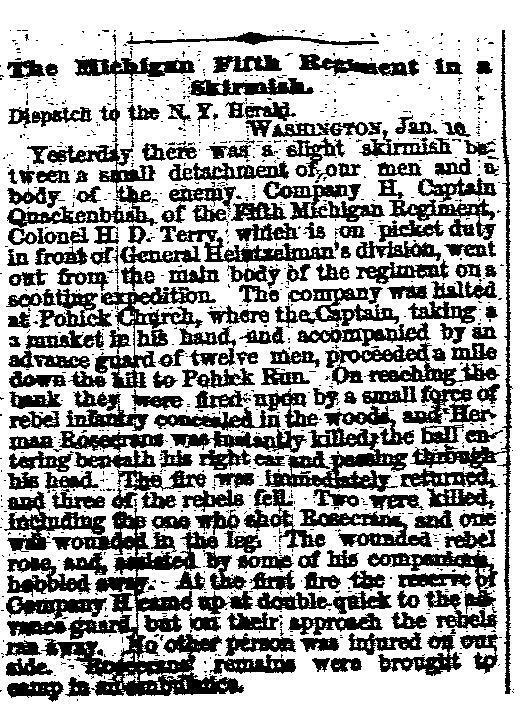 Report of Colonel H. D. Terry. CAPTAIN– I have the honor to report to you, for the consideration of the Brigade General, a statement of the engagement of yesterday near Williamsburg, Va., with a portion of the rebel enemy, so far as came under my observation. The Fifth Regiment of Michigan Infantry, under my command, arrived at the scene of action about 2½ o’clock P. M., and, in pursuance of the directions of our General, were at once deployed in line of battle in the woods to the left of the road leading to Williamsburg, the right resting a few rods from the road. The enemy was strongly posted in our front, with sharpshooters, using the weapon known as the Mississippi rifle. The Fifth moved forward in line of battle until the enemy were in full view, when a brisk fire was opened on them by our men, who fired very steadily. Perceiving that our men were suffering from the fire of their rifles, a charge was ordered, which succeeded in the retirement of the enemy for a short distance, when a sharp fire was interchanged, and he again retired under a charge to a rifle-pit in the edge of the woods, when he made a determined stand, and opened a brisk fire with severe effect. Another charge was ordered, and our men marched up on the double‑quick, and leaped into the rifle-pit, and carried the position and retained it. The enemy fled in confusion, leaving sixty-three dead on the field, besides the wounded. The wounded of the enemy found on the field were ordered carried to the hospital to be cared for by the Surgeons. The loss of the regiment in killed and wounded has been quite severe, an account of which will be fully stated in a separate return. It is due to justice to state thus the conduct of the officers and men, individually and collectively, which has been entirely satisfactory. So far as I have observed or been informed, the conduct of each and every one was such as to contribute to the final result. I remained upon the field during the entire time, with the exception of about ten minutes’ absence, owing to having a slight wound, too unimportant to mention except in this connection. I cannot submit this report without bearing testimony to the gallant conduct of Lieutenant Colonel S. E. Beach and Major Fairbanks, during the entire action. Lieutenant C. H. Hutchins, acting Adjutant of the regiment, and E. W. Smith, of the brigade staff, were of much assistance by their courage and activity in the field. Just before the close of the engagement Lieutenant Beach was severely, (but it is believed not dangerously) wounded by a shot received in the thigh. Major Fairbanks had his horse shot under him. 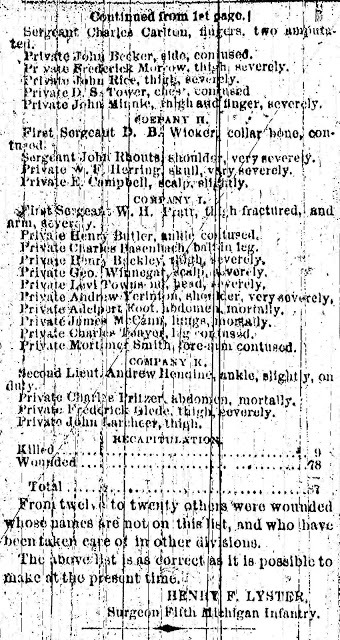 Captain Sherlock, company A, was wounded in the arm, and Captain Le Favour, company F, in the cheek and arm, early in the engagement, and late Lieutenant Tillotson, company K, was severely injured, by a shot in the hand. 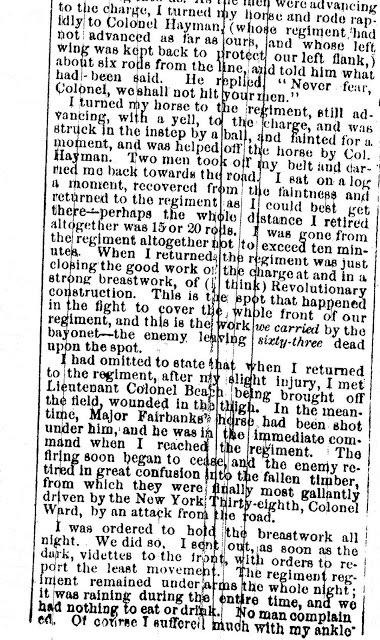 I am pained to be compelled to state that Lieutenant James A. Gunning, commanding company C, was shot through the heart and instantly killed, just at the moment of victory. H. D. TERRY, Colonel, Commanding. Capt. E. W. SMITH, A. A. A. General. The Battle of Fair Oaks was the first major battle (called the Peninsular Campaign) for the Fighting Fifth and many other Michigan regiments. For several days the aftermath was reported. Here is the first and there are several articles in this newspaper. A microfilmed fold mars this article. The next fold is small and should be fairly easy to read. Another of those folds is in this last part, but it's easily understood. There were several days of Free Press articles yet to come before subsiding into the silence between battles and other publishing. The Detroit Daily Tribune was undergoing major changes, which may explain an absence of coverage. Once again there is a bend or crease in the information. It's fairly easily identified as First Lieutenant J. Knox and G. Stantacher. Again there are several items in the wake of the recent battle. 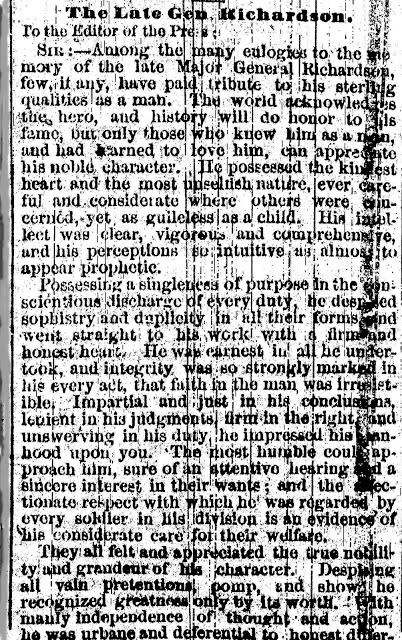 This letter of Col. Terry also appeared in the June 9, 1862 issue of the Detroit Daily Tribune. 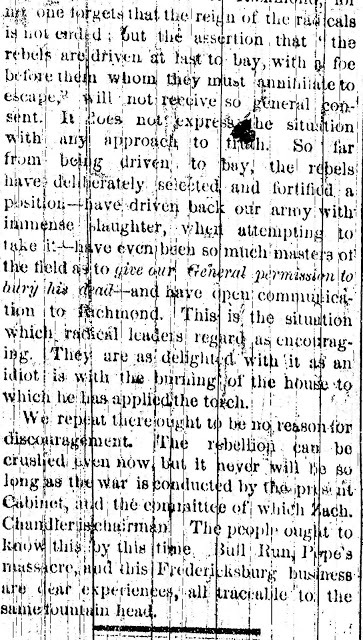 The letter from Colonel Terry about the fighting leading up to the assault on Richmond was printed in the Detroit Free Press, June 8, 1862 with attribution that it came from the Tribune and was printed there on June 9. There's no point in re-printing it here, but this gives an opportunity to mention the Detroit Daily Tribune name was about to change. As of July 10, 1862 it became the Detroit Advertiser and Tribune. That's a merger with the Detroit Daily Advertiser. Watch for it and you'll understand the name change. 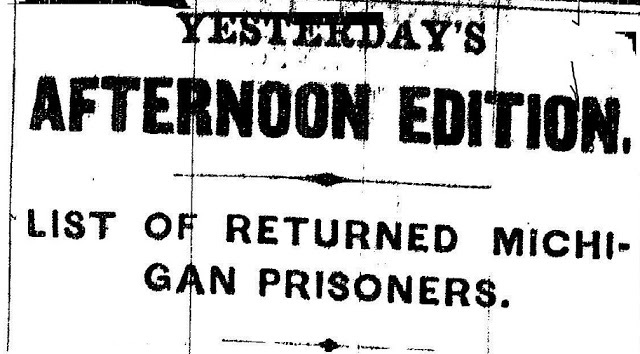 For today's newspaper readers, in 1919 the Tribune was absorbed by the Detroit News. The tenth of June has an "Interesting Letter from Col. Terry" and a few miscellaneous items. The letter is long enough that I had to split it into multiple segments. I used microfilm + "Paint." It's clunky and, if anybody could have given me a better way to handle the material, I'd have loved it. 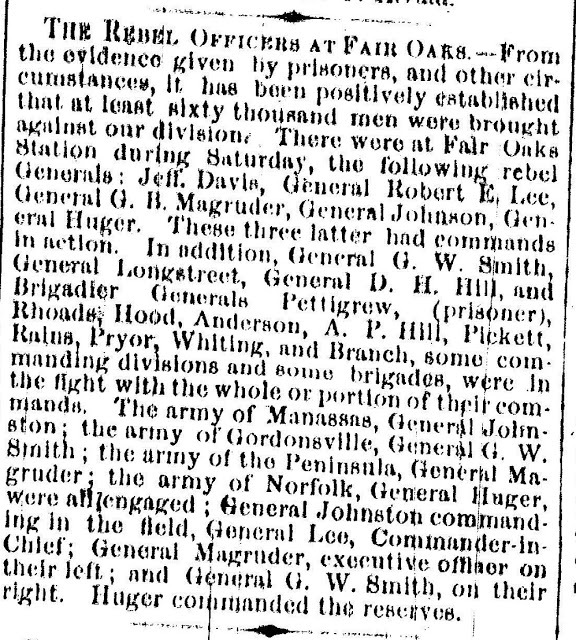 This miscellany includes a list of the Confederate officers recently engaged at Fair Oaks and the many names of that recent battle. 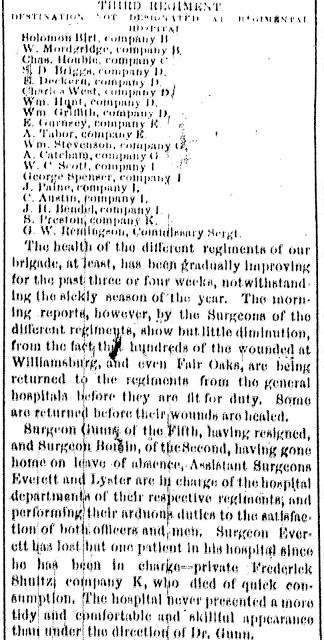 The Fifth Regiment's news of the aftermath of the Battle of Fair Oaks switches to listing Sick and Wounded. See the previous day for a list of other names for the battle. One of the most difficult things is trying to find listings of sick, wounded, imprisoned, and killed. It's no wonder people even traveled to the hospitals trying to locate soldiers. The article continues with other regiments and then the Fifth is listed. Now for the dead, wounded, and missing from the Battle of Fair Oaks. I omitted the Seventh Regiment. There are several articles here and they sometimes were broken apart in the microfilm process. As to the labels, I was limited on the number of characters for the original sidebar, so I always had to use the ones that seem to be the most important. I wish it could have been otherwise. 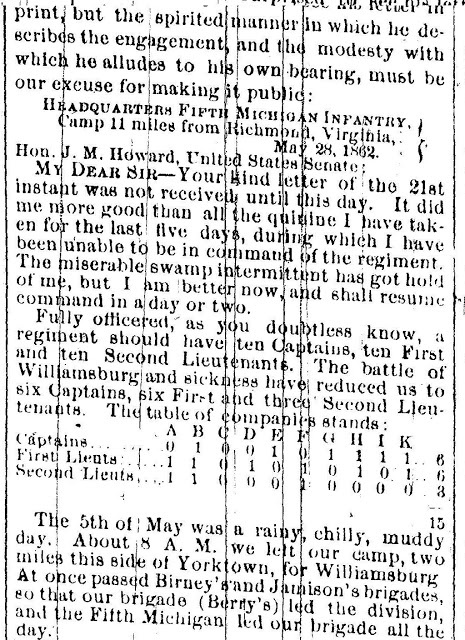 Technically this post is not about the 5th Infantry, but an article on General McClellan's Headquarters plus bits of news from Fortress Monroe would have been of interest to family and others interested in the 5th. This is the reporting of the sick and wounded along with a report about the hospital at White House Landing. I omit other regiments in the listings. 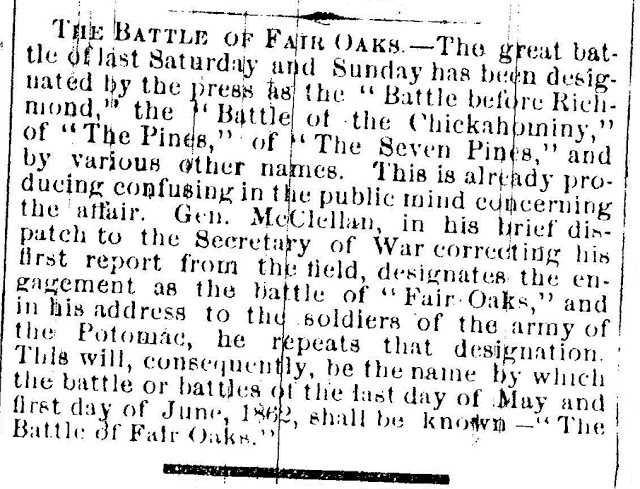 On this date in 1862 the Michigan Fifth Infantry and other Michigan regiments in the Army of the Potomac were still feeling the effects of their first major battle at Fair Oaks, Virginia and still waiting to move upon Richmond. This is the last time the Detroit Daily Tribune name will appear as the title of a post here. As of July 10, 1862 the newspaper merged with The Advertiser to become the Detroit Advertiser and Tribune. There also were no Free Press article on the Fifth until July 10. 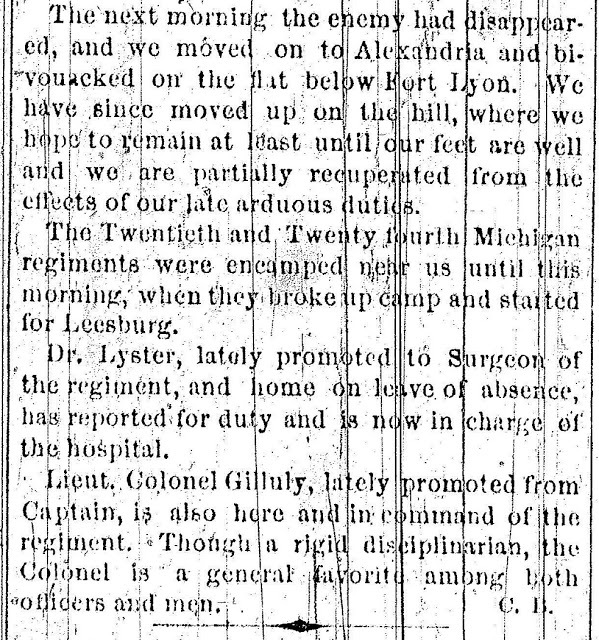 A daring story is listed in a letter about the heavy aftermath of the recent battle, along with a listing of the sick and wounded for the Fifth. There's first a small item about prisoners and then the main article on the 5th. Isaac Lerich lay on the battlefield for ten days before being taken to Libby Prison where his older brother, William, already was waiting. Will joined to "look after his little brother." The family didn't know where Will was at this point, just that he was missing. Since this blog tries to give you an understanding of how people on the homefront waited for news, you can imagine how the main article about the Fifth Infantry was received. Is it any wonder, after this column and the earlier article on the 15th, that the Lerich family wondered about their two sons, Isaac -- listed as wounded and a prisoner, and Will still only listed as missing? I didn't continue to the next column as there was no further news of the 5th. Watch for the next article. Family and friends certainly watched daily to not miss a word from the War of Rebellion...there was nothing Civil about that war. 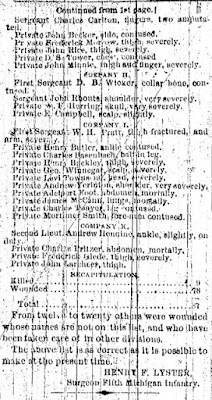 This is the first part of the day's information, listing men who had been prisoners, but were judged too sick to be held in a Confederate prison. The next two segments include about the draft, which will eventually affect the Fifth. 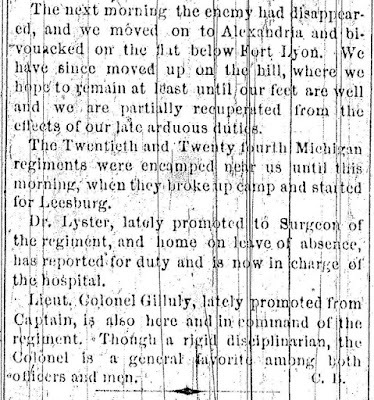 The heading for this final segment is the Third Infantry, but definitely includes medical information relating to the Fifth. Note that Dr. Gunn of the Fifth is especially mentioned. The result of those calls for reinforcements. See the previous article on quotas and a possible draft. My apologies on the size difference for the following segments. All are copied, resized, and cropped the same and yet differences occur. Alexandria, Frank Wells, Gen. Heintzelman, Gen. Kearney, hospitals, John Braden, Ladies Aid Society, Livingston County Republican, Munson's Hill, Potomac, Washington D.C. Fellow follower of the Fighting Fifth, John Braden, sent me this article that appeared in the Livingston County Republican. The newspaper's coverage during the War is not available at the Library of Michigan. To the best of my knowledge it is not available at any library, nor is it indexed. If you lived in the Detroit newspaper area, such news from beyond your area might have arrived by somebody mailing you a newspaper clipping. 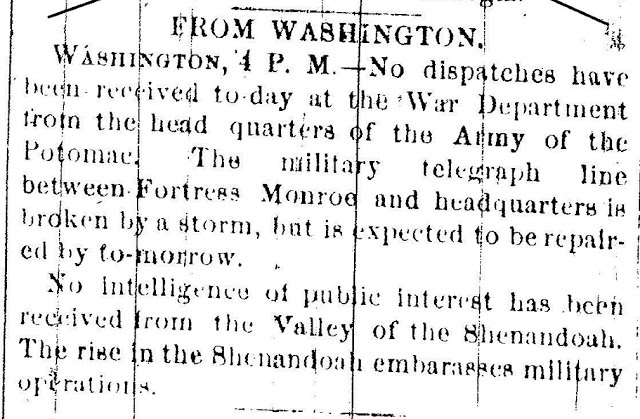 Information from the military was delayed, even with the telegraph and especially letters. In this day of instant communication it's hard to imagine something written on September 12 taking until September 26. 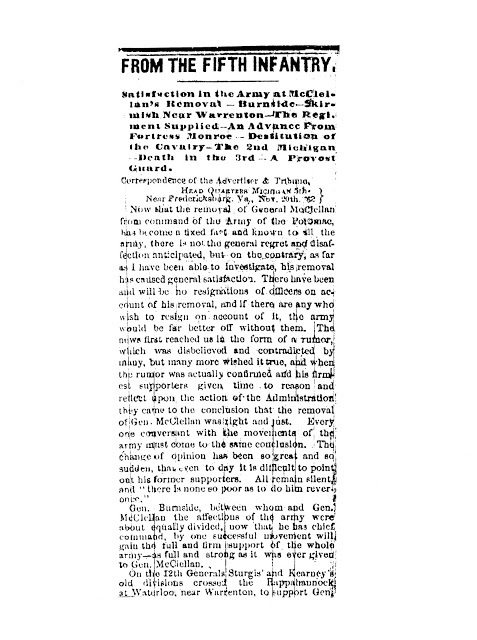 When McClellan's army engaged in the bloody battle of Antietam on September 17, people would have spread their worry and concern to friends and family beyond the Detroit area. 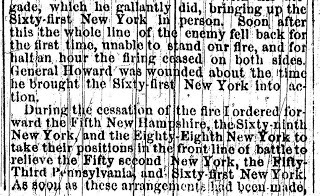 Other places with men in the Fifth Infantry, such as Howell, in Livingston County, would have been asked if they had any word about how things were going. 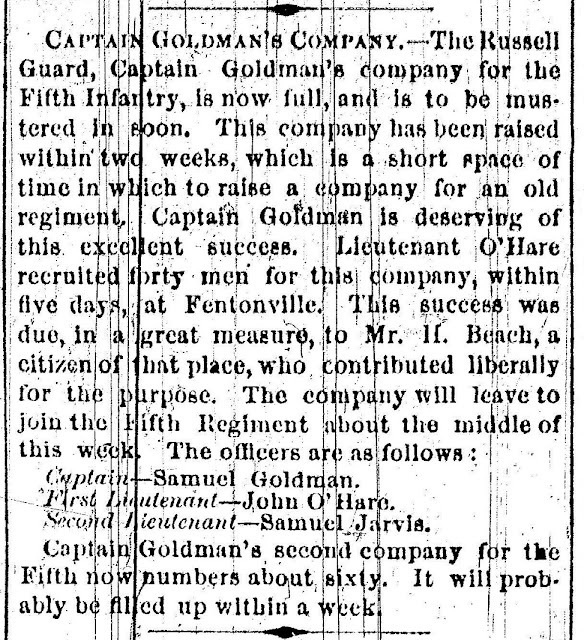 As mentioned in this letter, from September 2 - October 11, the Fifth's duty was in the defense of Washington, D, C.
Back at the time of the Civil War Centennial, the Burton Library at Detroit Public Library's newspapers were indexed by librarian, Helen Ellis. Imagine the difficulty of families and others trying to follow news of the Fighting Fifth. What may appear if you catch the morning edition may not be the same as appears later in the day. John sent the following from the valuable correspondent who signs his reports, GWW. This article is the start of a series of sniping between the Free Press and the Advertiser and Tribune. 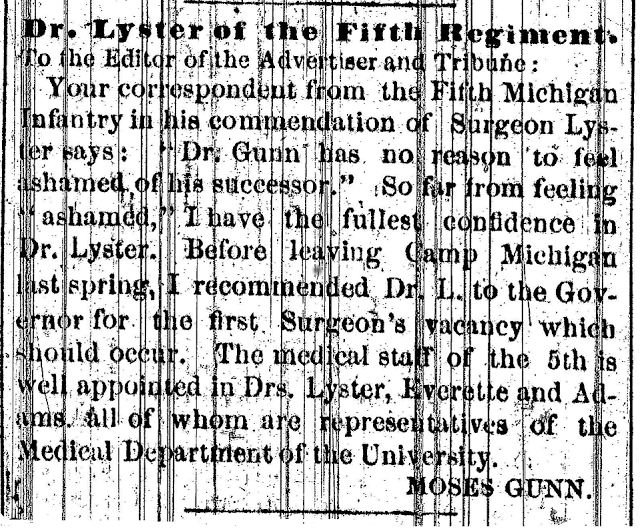 In a different edition with the same date I found the following bit from Dr. Moses Gunn, the former physician and surgeon to the Fifth. 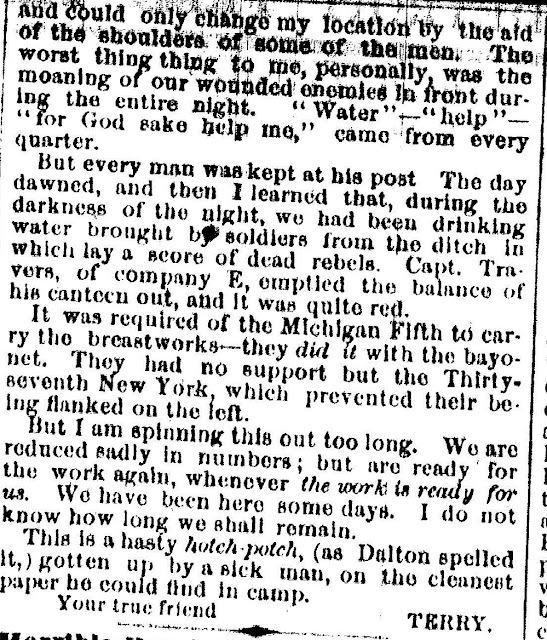 The "joys" of an army marching are revealed by Detroit Free Press Civil War correspondent, C.B. Additionally Dr. Adams is promoted. The close of the war by fall is anticipated. I've sometimes kicked myself over things I figured were my fault. Today's article shows the same flaw on both a version from John Braden and my own version. If it helps, I decided what was said in the third paragraph from the end is "movement of the baggage trains. The Michigan 5th is out on picket today," the rest is legible. That flaw happened ages ago during the microfilming. John's copies are already free of scratches and of fairly uniform size, although I notice he, too, has a problem with that. John, the difference in sizes makes me feel a bit better about my own difficulty with that problem. 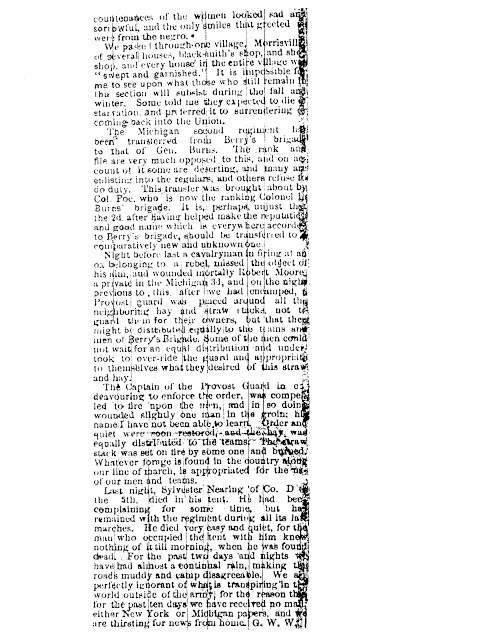 So here is the news from Advertiser and Tribune correspondent, G.W.W. who rather wearily notes this is the fifth movement into Virginia in eight months. 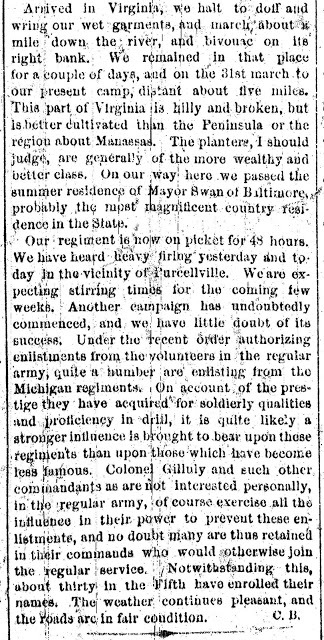 The mention of the Pontiac Gazette is a sore point as the Pontiac Civil War microfilmed newspapers have disappeared from the various Oakland County libraries holding microfilmed newspapers! More marching 150 years ago viewed from Thanksgiving day in 2012. I'm thankful for the ability to look back at these brave men of so long ago and also for fellow researcher, John Braden's sharing. It was common for news from the war to be watched for as it traveled out into the surrounding towns from the Detroit publishers. Today's article just makes the December 1 deadline. 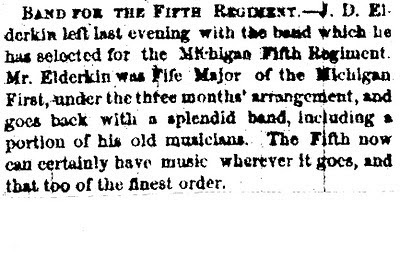 This is John Braden's copy for the actual article on the Fifth Regiment. John, working from a different side of Michigan, sometimes accessed a different edition for some of his work. I used the Library of Michigan microfilms. This time we must have had the same copy for December 1 because both are very scratched in the same places. Fortunately it is at the edge of the column and is usually easily figured out. After these field notes from Advertiser and Tribune correspondent, G.W.W., I added the news of the death of General Richardson and tributes to him that followed. 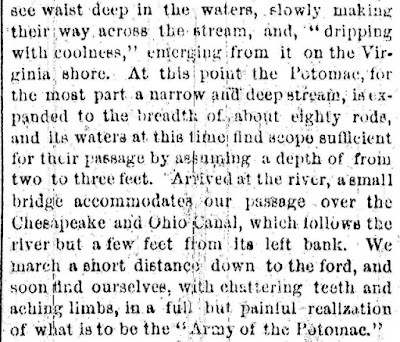 Since he was the commander over the Fifth and other regiments in the Army of the Potomac it seems appropriate to add that material. It's also an interesting contrast that the field notes mention the deaths of two ordinary soldiers, Private Sylvester Nearing, of Company D in his tent and the accidental shooting of Private Robert Moore. This is in addition to the Field Notes regarding the death of General Richardson. It has some dark areas that can't be removed unfortunately. The delay in posting is evident here. Advertiser and Tribune field correspondent, the mysterious G.W.W., dates his efforts Nov. 27, but it didn't appear in the newspaper until December 6. Possibly this is due to the delay in mail that he mentions. This is a merger from John Braden with my software and his. This should let us reproduce with the best combined clarity and size for ease of reading the sometimes less than ideal microfilm. Wish I could say all future posts will be of this quality. John's material to me ended on January the 13th, 1863. The results of our partnership was promising and better than either of us alone could produce. I continued with what I could locate at the Library of Michigan in their microfilmed newspapers. This is the kind of news nobody wants to see when somebody they love has gone to war. Much more will be said about this tomorrow in newspaper articles published on December 20, 1862. John Braden found this initial notice. I was able to find a Detroit Free Press article for the 20th, while he supplied a Detroit Advertiser and Tribune article for the same date. This article of field notes dated December 15 is from five days later in the Detroit Advertiser and Tribune and is provided by John Braden. 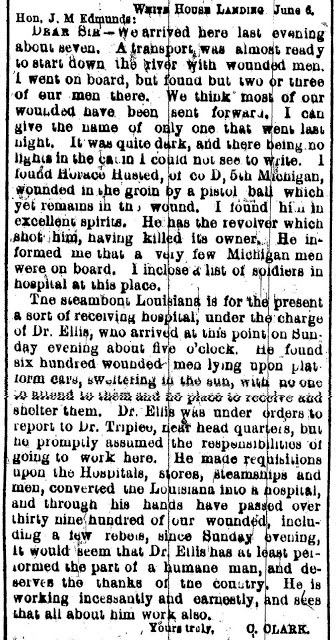 I follow with several articles I found in the Detroit Free Press also published on December 20, 1862. 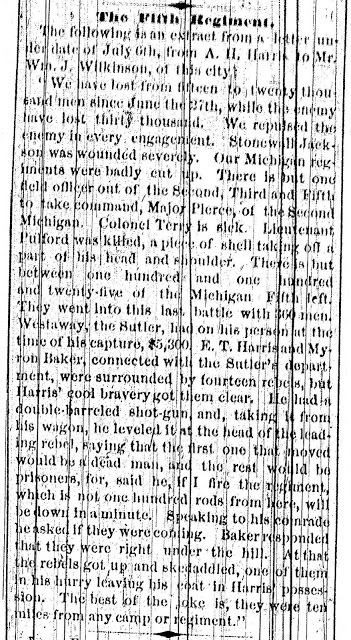 The Detroit Free Press for December 20, 1862 combines several articles in its view of all that happened at Fredericksburg. The field reports are in part one. Reactions are in part two. An official report is in part three. 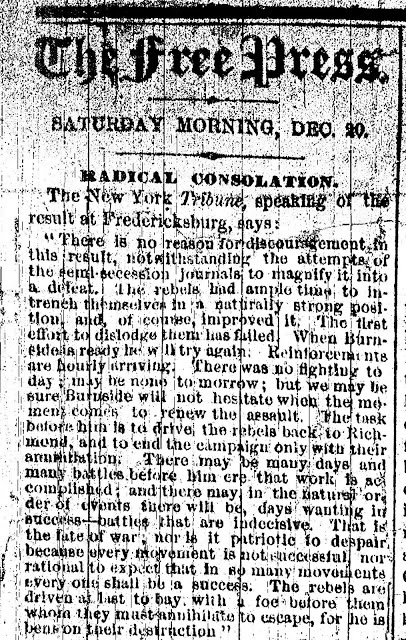 This editorial criticizes the New York Tribune's views on Fredericksburg. 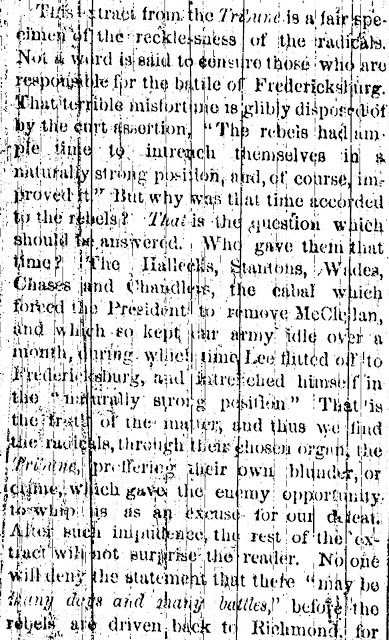 Part 3 gives the official report of the evacuation of Fredericksburg. 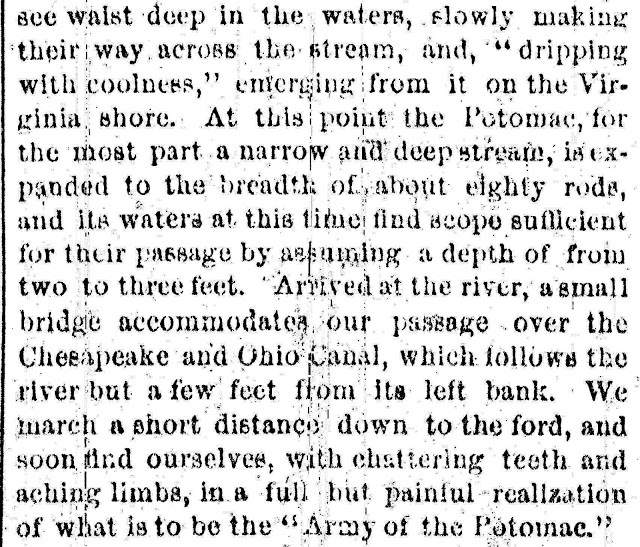 The December 20th issue ends with the official view of Fredericksburg. Note that this December 17 conclusion came after the December 15 battle and the reactions in part two were also dated December 17. 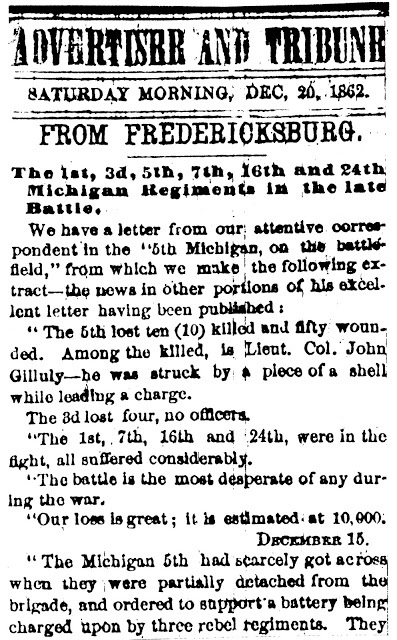 The date a newspaper publishes about a battle can be misleading unless you allow for the delay in receiving the information. The aftermath of Fredericksburg continues on Christmas eve in a fuller list of those recognized as killed in action. 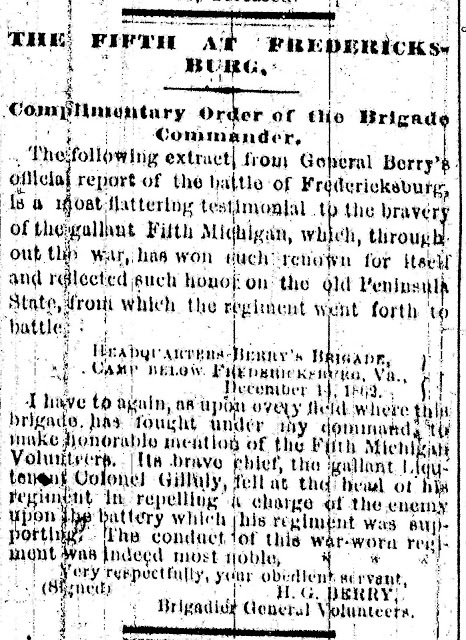 This is the official commendation by Brigadier General Berry of the Fifth at Fredericksburg and especially of the Lieutenant Colonel Gilluly, who died leading his regiment into battle. 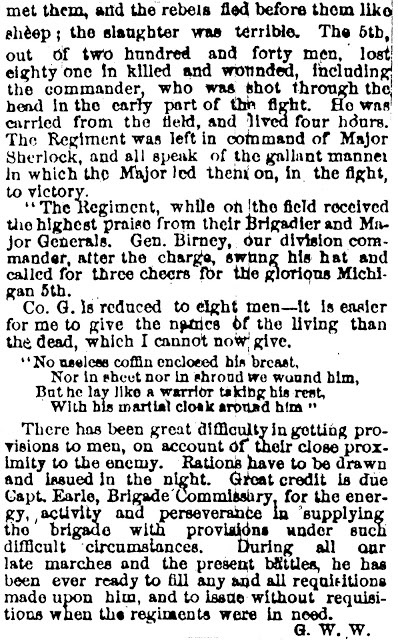 This is the formal commendation of Lieutenant Colonel Gilluly by the Fifth Regiment officers.